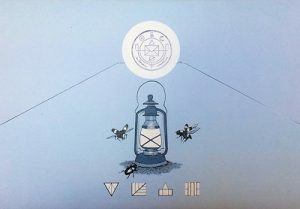 While rooting around the Travelling Man game shop in York, I came across a series of nicely presented envelopes promising “codes, ciphers, riddles, spells and illusions inspired by witchcraft and alchemy”: the Cryptogram Puzzle Post. Issued monthly since March 2017, each envelope holds a self-contained bundle of 7 small puzzles, leading one to the next towards a final solution. That solution can be emailed to the author for confirmation of its correctness, or a set of three correct answers from a full Season can be submitted to unlock a “mystery art” prize. A final present from me for Christmas! This time it’s a Picross puzzle. A picross is a logic puzzle. They’re also called Nonograms, Hanjie, Griddlers or “Paint-By-Numbers”. The goal is to blacken squares in a grid to create a picture. Numbers around the grid are clues. From these clues you can deduce exactly where all the black squares go using logic and deduction. There is only one solution where the clues in the columns and the clues in the rows are consistent. 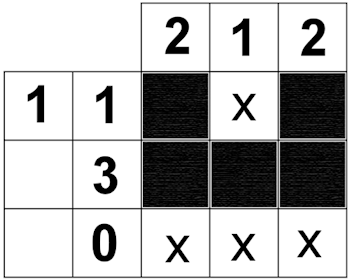 Each clue number signifies an unbroken line of black squares. These lines appear in the same order as the numbers, running left to right for the rows and top to bottom for the columns. Every line of black squares is separated by one or more un-blackened squares. You can mark these in with light Xs. A zero means the entire row or column is unblackened. Cryptic crosswords are one of those things you either love or hate, that you either understand or can’t stand. Part of the problem is that there is a huge set of rules for solving them which you are simply supposed to know. If you don’t know the rules, you’ve got no chance. This post is a Chritmas present to readers. It includes a short introduction on how to solve cryptic crosswords and a special Christmas themed crossword to try your hand at. It is not like some of the devious cryptic crosswords in the broadsheets. Most of the clues should be fairly easy and fun. 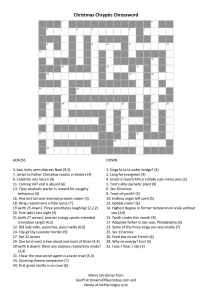 You can click on the image to the right to view the crossword at full size, and here is a PDF version to download and print. I believe that puzzles are a great activity for families stuck together for extended periods trying to think up topics of conversation! So print a few of the crosswords off and work together over the holiday period to find the answers. 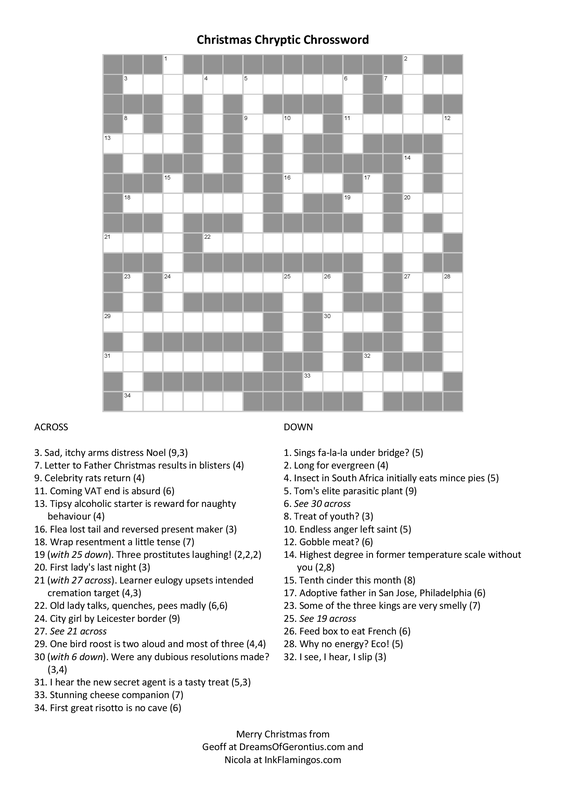 This crossword and the primer below were written by myself and my partner in crime at inkflamingos.com. Please visit her art blog! I have been trying out some Adalogical Aenigmas at Pavel’s Puzzles over the past couple of weeks, and the quote above popped out as an answer to one of them. I’m sharing it here since, with winter closing in, I’m sure many people must yearn for a little warm sun and a little tenderness at the moment. Winter is coming, but it perforce gives way to the Spring. By the fireside, but in the cooler shade. This post contains a small collection of picture puzzles. Some require logic to solve, others spatial awareness and others are language based. 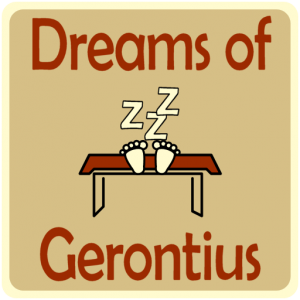 Can you solve this fiendish picture puzzle which emerges from The Dreams Of Gerontius? Click the image for the full size version. Pairs point to a wheel of colour circling five tones. 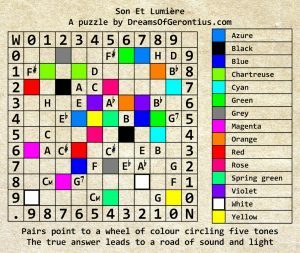 The true answer leads to a road of sound and light. The table on the right is there to help those who are colour blind. Leave a comment if you get the answer. I’ll let you know if you’re right but will edit out spoilers for those who come after. 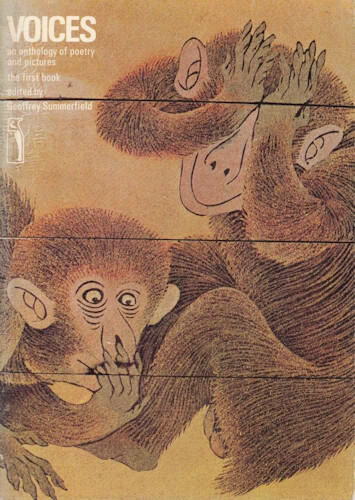 I have in my collection of books a series of anthologies called “Voices”, put together by some chap called Geoffrey Summerfield in the late 1960s. The books contained a mix of obscure, anonymous poems as well as lesser-known scribblings by famous writers. Among them are various riddles, some ancient, some modern. 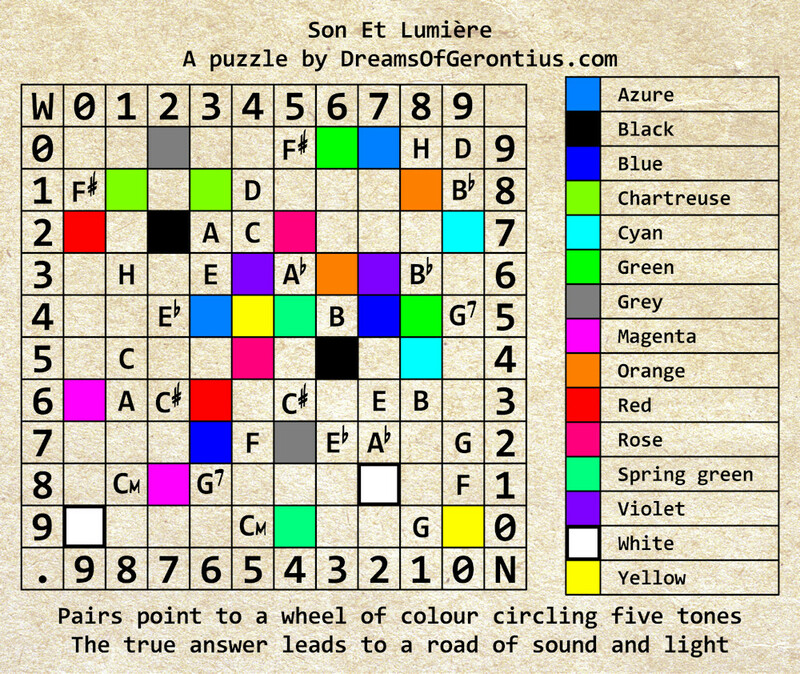 The answers are written in “white text” under each riddle. Highlight the text to read it.